Monjas-Cánovas, I (1); Abarca-Olivas, J (2); Moreno-López, P (2); Gras-Albert, JR (2). The advent of endoscopic technologies and techniques has expanded the limits of conventional endoscopic surgery. 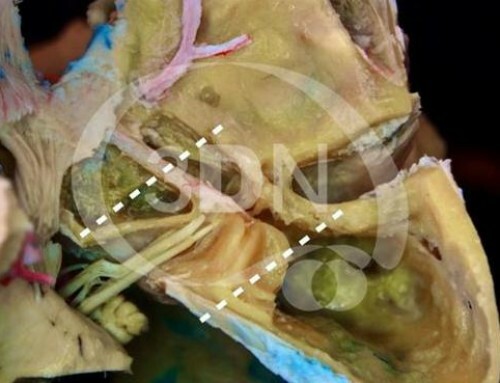 The expanded endonasal approach describes a series of surgical modules in the sagittal and coronal planes that allow surgical access to the entire ventral skull base. The nasal cavity opens anteriorly onto the face through the anterior nasal aperture and posteriorly into the nasopharynx by way of the posterior nasal apertures or choanas. The particular localization of the nasal cavity bounded above by the anterior cranial fossa, laterally by the orbit and the maxillary sinus, and below by the hard palate, provides an excellent surgical corridor to approach the majority of the skull base lessions. The expanded endonasal approach requires the acquisition of new endoscopic anatomical knowledge. A good understanding of the osseous relationships of the nasal cavity is therefore first needed. In the following pictures we will discuss step by step the most important anatomical landmarks in the disarticulated skull. Located in the upper mid-third of the face, the nasal cavity, is made up by a complex articulation of cranial and facial bones that articulate each other around the ethmoid bone. The ethmoid bone is an impared bone located in the midline that makes up a portion of the anterior cranial floor, forms part of the medial wall of the orbits but mainly participates in the anatomy of the medial and lateral walls of the nasal cavity. It consists of four parts: a horizontal plate or cribriform plate, a perpendicular plate, constituting part of the nasal septum; and two lateral masses or ethmoidal labyrinths. CR: cribiform plate (red dotted line) Perpendicular plate: black dotted line ET LAB: ethmoidal laberynth. In a superior view, we can identify the horizontal part or cribiform plate: wider posteriorly than anteriorly is a perforated area through which the olfactory nerves pass.It separates the nasal cavity from the anterior cranela fossa and divides the vertical part in two parts: A superior or endocraneal part and an inferior or septal one. The superior projection or endocraneal part is the triangled shaped crista galli. The long thin posterior border of the crista galli serves for the attachment point of the falx cerebri. Its anterior border, short and thick, articulates with the frontal bone, and presents two small projecting alae, which are received into corresponding depressions in the frontal bone and complete the foramen cecum. CG: Crista galli ET LAB: ethmoidal laberynth CR: cribiform plate Alae crista galli: red dotted line. The inferior projection is the perpendicular plate of the ethmoid bone which forms the most superior and posterior part of the nasal septum.The nasal septum is formed anteriorly by the septal cartilage, above by the perpendicular plate of the ethmoid, and below and posteriorly by the vomer. The anterior border articulates with the spine of the frontal bone and the crest of the nasal bones. The posterior border articulates by its upper half with the sphenoidal crest, by its lower with the vomer. Extending laterally to the cribiform plate, the lateral masses can be identified. The lateral surface of the laberynth is formed of a thin, smooth plate, the lamina papyracea which make up a large part of the medial wall of the orbit. Frontal view of the orbit. Lamina papyracea. The lateral limit of the ethmoidal surface is formed by the lamina papyracea. The Labyrinth or Lateral Mass consists of a number of thin-walled cellular cavities, the ethmoidal cells, arranged in two groups, anterior and posterior. The upper surface of the labyrinth presents a number of half-broken cells, the walls of which are completed, in the articulated skull, by the edges of the ethmoidal notch of the frontal bone. While the cribriform plate is received into the ethmoidal notch of the frontal bone and roofs in the nasal cavities, the ethmoidal half-broken cells are completed, in the articulated skull, by the half-broken cells of the frontal bone. The ethmoidal notch is excavated in the midline of the orbitonasal portion of the frontal bone. It is bounded anteriorly and medially by the anterior nasal spine and laterally by the half broken cells of the frontal bone. The ethmoidal notch separates the two orbital plates; it is quadrilateral, and filled, in the articulated skull, by the cribriform plate of the ethmoid. The margins of the notch present several frontal half-cells which, when united with corresponding half-cells on the upper surface of the ethmoid, complete the ethmoidal air cells. The Orbital or Horizontal Part consists laterally of two thin triangular plates, the orbital plates, which form the vaults of the orbits. The supraorbital margin forms the upper boundary of the base of the orbit, and separates the squama from the orbital portion of the bone. At the junction of its medial and intermediate thirds is a notch, sometimes converted into a foramen, the supraorbital notch or foramen, which transmits the supraorbital vessels and nerve. Articulation of the ethmoid and frontal bones. Endocraneal view. Articulation of the ethmoid, frontal and sphenoid bone. The frontal bone roofs the nasal cavity by its superior articulation with the ethmoid. Posteriorly, the nasal cavity is bounded and closed in by articulation with the impaired sphenoid bone. The posterior surface of the ethmoid bone presents large irregular cellular cavities, which are closed in by articulation with the anterior wall of the sphenoidal bone. The anterior surface of the body of the sphenoid bone articulates laterally with the posterior margin of the ethmoid cells. In the middle line it presents a vertical crest, the sphenoidal crest, which articulates with the perpendicular plate of the ethmoid, and forms part of the nasal septum. The inferior surface presents, in the middle line, a triangular spine, the sphenoidal rostrum,wich is continuous with the sphenoidal crest on the anterior surface, and is received in a deep fissure between the alæ of the vomer. The vomer articulates with the postero-inferior margin of the perpendicular plate. It forms the most posterior and inferior portion of the nasal septum. The frontal bone and both maxilar bones articulated. The maxilla is one of the largest bones of the face and form, by their union in the midline, the piriform aperture. Each assists in forming the boundaries of three cavities: the roof of the mouth, the floor and lateral wall of the nose and the floor of the orbit; it also enters into the formation of two fossae, the infratemporal and pterygopalatine, and two fissures, the inferior orbital and pterygomaxillary. Above the incissive fossa is the infraorbital foramen, the end of the infraorbital canal; it transmits the infraorbital vessels and nerve. Medially, the anterior surface is limited by a deep concavity, the nasal notch or piriform aperture which ends below in a pointed process, which with its fellow of the opposite side forms the anterior nasal spine.Each bone consists of a body and four processes: zygomatic, frontal, alveolar, and palatine. The frontal process is a strong plate. Its upper border articulates with the frontal bone. The anterior boder articulates with the nasal bone and the posterior border articulates with the lacrimal bone. The small thin lacrimal bone form the anterior portion of the medial wall of the orbit. The posterior border of the frontal process of the maxilla together with the lacrimal bone form the lacrimal fossa for the lodgement of the lacrimal sac. The orbital surface of the maxillary bone is smooth and triangular, and forms the greater part of the floor of the orbit.At the middle of the posterior border, there is a groove, the infraorbital groove, which passing forward, ends in a canal, the infraorbital canal which opens just below the margin of the orbit and serves for the passage of the infraorbital vessels and nerve. The posterior margin of the orbital surface forms the inferior margin of the infraorbital fissure that is bounded above by the lower border of the great wing of the sphenoid. The fissure transmits the maxillary nerve and its zygomatic branch, the infraorbital vessels, the ascending branches from the sphenopalatine ganglion, and a vein which connects the inferior ophthalmic vein with the pterygoid venous plexus. Through the inferior orbital fissure the orbit communicates with the temporal, infratemporal, and pterygopalatine fossae. Maxilla. Posterior view. Infratemporal surface. Iit can be identified that the maxillary bones also contribute in forming the medial wall and the floor of the the nasal fossae. The maxilla has a perpendicular portion and an horizontal portion. The palatine process or horizontal portion of the maxilla projects medialward from the nasal surface of the bone. It forms a considerable part of the floor of the nose and the roof of the mouth which are completed by the articulation of the horizontal portion of the palatine bone. The floor of the nose and the roof of the mouth are build up by the articulation of the horizontal portion of the maxilla and palatine bones. The inferior surface is perforated by numerous foramina for the passage of the nutrient vessels; is channelled at the back part of its lateral border by a groove for the transmission of the descending palatine vessels. When the two maxillae are articulated, a funnel-shaped opening, the incisive foramen, is seen in the middle line. The posterior border is serrated for articulation with the horizontal part of the palatine bone. The nasal surface presents a large, irregular opening leading into the maxillary sinus. It is a large pyramidal cavity, within the body of the maxilla. In front of the opening of the sinus is a deep groove, the lacrimal groove, which is converted into the nasolacrimal canal, by the lacrimal bone and inferior nasal concha; this canal opens into the inferior meatus of the nose and transmits the nasolacrimal duct. More anteriorly is an oblique ridge, the conchal crest, for articulation with the inferior nasal concha. Superiorly is the conchal crest for the articulation of the middle turbinate. Saggital cut. Lateral wall of the nose. The maxillary sinus presents in the disarticulated bone, a large, irregular aperture, communicating with the nasal cavity. In the articulated skull this aperture is much reduced in size by the following bones: the uncinate process of the ethmoid above, the inferior nasal concha below, the vertical part of the palatine behind, and a small part of the lacrimal above and in front. Saggital cut at the level of the lateral wall of the nose. Thiel specimen. The anatomy of the lateral wall of the nasal cavity is highly complex and variable. In this sagittal picture we can easily identify three projections corresponding to the inferior, middle and superior turbinates. Among these turbinates the superior and the middle turbinates are components of the ethmodial complex whereas the inferior turbinate is a separate bone. Beneath each turbinate is a meatus, named according to the turbinate just above it. After having exposed the osseous relationships of the nasal cavity, in others chapters of the Atlas , the endoscopic endonasal anatomy and the most important anatomical landmarks will be discussed.